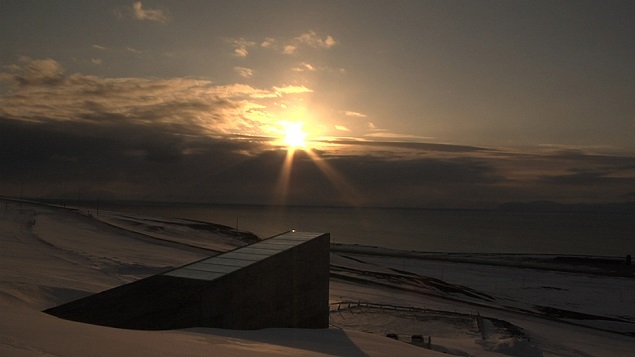 The Svalbard Global Seed Bank as the sun sets. Photo Credit: Mari Tefre. It wouldn’t take much to eradicate the world’s food supply. Major agricultural producers have systematically reduced crop diversity in favor of profits, stripping species of natural defense mechanisms and leaving them vulnerable to a single plague. Meanwhile, climate change threatens countless more species and disrupts traditional, sustainable growing practices. Simply put, food security is a big issue. Rest at ease, hungry reader, as should disaster decimate a region or global trends ought to slowly eradicate foodstuffs the world over, there might be a way to reboot agriculture. Humanity’s greatest hope for surviving food threats is buried 400 feet inside a sandstone mountain on the remote Spitsbergen Island, part of the Arctic Svalbard archipelago about 800 miles from the North Pole. Known as the Svalbard Global Seed Vault, or as the “frozen garden of Eden,” this facility ensures crop diversity through an immense collection of seeds. Filled by donations from gene banks around the world, the remote location of the Svalbard facility — along with advanced storage techniques, temperature and moisture control — and the combined oversight of several governments and NGOs ensures specimen security. Constructed in 2008, the Svalbard facility was the brainchild of Cary Fowler, Executive Director of the Global Crop Diversity Trust. While most people never consider the issue of food security, Fowler lectures about the precarious position of our food supply and advocates for crop diversity. His work with the seed vault, personal struggles, and seemingly boundless tolerance for ignorant audiences are the subject of a new documentary, Seeds of Time, by Academy Award nominated director Sandy McLeod. Director Sandy McLeod. Photo: Sandy McLeod. The film also investigates like-minded groups protecting seeds around the world: a group of Peruvian farmers who cultivate potato species, plant collectors hunting for wild specimens to breed diversity, and members of the Seed Savers Exchange in Iowa who distribute heirloom varieties. Though these thankless guardians have seen moderate success, more often Seeds of Time reveals challenges advocates face against a global threat and unwilling ears. Motivated only by the communal good, Fowler and his compatriots comprise a global movement serving the global community. Frankly put, the hopes of a world of eaters rest on their shoulders. GALO recently spoke to McLeod about her feature debut, which opened in theaters on May 22. The acclaimed director, who is best known for her work on Something Wild (1986) and Red Hot and Blue (1990), discussed her interactions with Fowler, food security, potato farmers, and documenting it all. GALO: In your director’s statement, you explain that your initial meeting with Cary Fowler compelled you to make this film. Did you have any connection with the issue of food security before that meeting? Were you already interested in making a film about food? 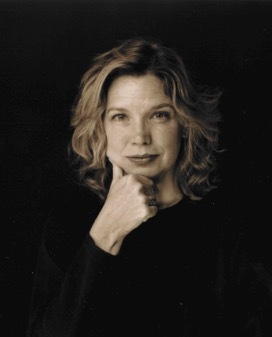 Sandy McLeod: I was always a foodie and interested in food, but not in any professional way. When I met Cary and began to understand the scope of what he was dealing with, I realized there were things he was talking about that needed to be part of the public discourse about food and food security. Looking at myself as an average Joe, these weren’t things on my radar. I’d never thought about food banks or the importance of diversity in agriculture. Or even agriculture and climate change in any serious way. I was one of those people who sort of assumed it would adapt. It was a rude awakening for me — one of those things where I couldn’t let it go. I wanted to find out more about this. GALO: You had primarily done shorts before this film. What made you think this project was right for a feature-length film? SM: Well, I wanted to do a character driven piece. Yet there was a tremendous amount of education that needed to happen for the audience to understand what [Cary] was up to. So those two things didn’t allow me to take the short approach. Bringing people up to speed was going to take time. [I had to show] people why Cary is a significant player. What is the [issue’s] origin? Why does it matter? How many food banks are there? Why are they important? These are all things that the film had to introduce. It’s kind of like making an issue-driven film, but starting from scratch. It’s an issue not everyone knows is an issue. GALO: Why do you think people are so unaware of an issue that carries such severe consequences? SM: I think that we have become disconnected from our food. We get caught up in other issues, not negligible ones, but some that are not as important as the foundational aspects of food security. So many people asked me why I didn’t deal with GMOs in this film. One reason I didn’t is that it’s a huge hot-button topic. People have opinions about GMOs, but they don’t know the basics about seeds. If you ask people the difference between a hybrid and a GMO, they probably don’t even know. That makes this an issue worth examining carefully. GALO: A hot-button issue you do choose to touch on is climate change. Cary is very clear that the issue of food security is an issue of climate change, whereas others wouldn’t necessarily make that connection. Did you envision this project as a commentary on climate change? SM: I didn’t initially realize what a huge part climate change would play. I interviewed scientists, including about 150 people not [shown] in the film. There was no question to them that climate change was a reality, so as a filmmaker I never questioned that premise. If you think about the stress agriculture is already under, without even considering climate change, you begin to see what a fragile system we depend on. Climate change really just put it over the top for me. It made it a more immediate issue that we need to look at before we face a crisis. I took climate change as a given, and I think that’s clear in the film. I never try to convince people that it’s an issue. Peruvians on the hill top. Photo Credit: Henrik Edelbo. GALO: In a sense, the advancement of agricultural techniques and industrial machinery are partly to blame for reduced crop diversity. 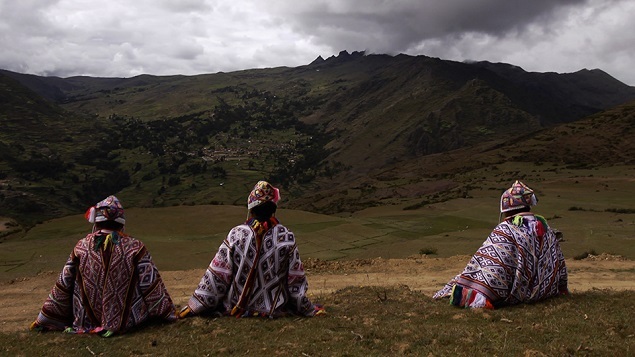 Do you think that technological advancement can solve the problem it has caused or do you think solutions need to come from elsewhere — maybe from places like the Potato Park community of indigenous Peruvian farmers featured in the film? SM: I think we’re going to need every tool in the bag. I wouldn’t rule anything out. I would say we need to be thoughtful and careful. But we’ll probably need everything we have at our disposal to confront the issues at hand. The Peruvians, for example, are very important for two reasons. They are the people that save the diversity. We look at the small farmer as someone we need to help. When in fact, they’re the ones who have saved most of the diversity we have left. There is a group in Kazakhstan growing out a huge diversity of apples, and these [aforementioned] Peruvians [are] growing out a diversity of potatoes. But that’s not really happening on any national scale. That’s something we really need to encourage. Those crops have a better chance at adapting if they’re helped to grow in an adapting climate. GALO: You mentioned that there a lot of different ways to contribute to a solution. We shouldn’t rule anything out. I noticed on the Web site associated with this film that there are a number of ways to pitch in. Did you go into the film hoping to motivate viewers to action? And are your hopes now the same as when you started or have your expectations evolved? SM: I don’t think we can depend on governments to solve this problem. It would be nice if we could, but the will doesn’t seem to be there. Corporations are running the larger food system and that is likely to remain the same. As individuals, we have a tremendous amount of power with what we buy and what we put on our plate. When I started the film, I did want to generate awareness about the issue, but I didn’t know at first what people could do. I lived with this subject for eight years and saw huge collections lost and saw how disconnected we all are from food, myself included. But I also saw that there are a lot of things we can do. We really focused on that on the Web site. I think it’s frustrating for people to be confronted with these issues and then to feel there is nothing they can do about it. GALO: On the other side of things, specifically in terms of the disconnected average Joe, there are these Peruvian farmers, who have intense cultural connects with their food. Do you think that’s a unique example, or do you think there are widespread, unseen cultural implications to the way we deal with food? SM: We’re a largely immigrant country. When people first came here, they sewed seeds into their clothes. They wanted that connection to the place they came from and the culture attached to that place. At one point, we all had that connection, but we gave it up for the TV dinner and fast food. I think now we’re starting to realize what we gave up with that. The connections to community [in food] and in sharing a meal have been lost. I think people really feel the absence of that. The Peruvians show us what that can look like and what that did look like. GALO: You chose to interweave this larger crisis with Cary’s own personal story and his fight with cancer. Did you choose to highlight Cary in this way to emphasize his commitment, or does his personal story hold some other significance in terms of overtones for the larger issue in the movie? SM: I think it does [have overtones]. When I found out he had beaten cancer twice, it seemed a very powerful metaphor. Cary represents all of us and the challenges we face. He has this ability to transcend incredible hardship and illness, and we live on a sick planet. I thought he was a great metaphor for the fragility that we all hold. He didn’t get sucked into the thought that he was going to die. He was sitting there with it, thinking about what he could do to make life meaningful for himself. That’s a beautiful message as well, I think. GALO: This idea of fragility — that this issue might transcend a single life — is certainly present when Cary talks about putting his ashes in the seed vault. The farmers similarly want to preserve their culture beyond their generation. Does the documentary form work here to preserve this legacy? How do you consider the relationship between documentary and this subject? SM: Well, there’s something intrinsically fascinating about the fact that it’s a real person and a real story. It’s not happening in someone’s imagination, but in the real world. The same with the Peruvians, they represent a memory for us. To see the beauty of that situation and to know it is real somewhere in our world — that might be more powerful than if this were a narrative film. There’s an immediacy and a connection to it that you can trust a bit more than in a narrative film. I have no beef about narrative films. But in this case, I think the reality gives people something more to hang on to. Cary’s not a movie star. He’s a real guy with real problems. But he also has tremendous tenacity and courage. In that sense, the documentary form has a lot of power. GALO: Do you think you’ll continue to do documentaries? What’s next for you? SM: I think so. Not that I wouldn’t do a narrative. My background is in narrative film. I’m interested in both worlds. But I have another idea for a film I’d like to make. I’m still researching, so I won’t tell you what it is [laughter]. I think it’s another story that can benefit people in a similar way to this one, but from a completely different place. It’s not related to food. Though I have to say, there are so many stories in that [food] world that need to be told. I ran across a lot of them in researching for this film. I hope people out there will stick with it. There’s a lot more there we need to know. “Seeds of Time” Trailer from Hungry, Inc. on Vimeo. For more information about the film, “Seeds of Time,” including current and upcoming screenings, please visit the official Web site by clicking here. The film will be released on VOD/DVD and Blu-ray fall 2015. || Featured image: Searching for potato wild relatives in Arizona, USA. Photo Credit: Kirsten Johnson.